I was at HomeGoods awhile back and I stumbled upon a beautiful, clear glass lamp that OPENED so you could fill it with whatever your heart fancied. I immediately wanted it, because, you know...I totally like swapping things around in my house on, like, you know...a daily basis. Imagine the treasures I could display for every season, every holiday, every whim. I left the store without it. But, that glass lamp stuck with me. Long enough that I decided to make my own. However, there were those pesky lamp guts to deal with. And, a lid for the glass container was pretty important, but the lamp guts needed to get inside the lamp somehow. 1. Lamp guts needed to get into the container. 2. Lamp guts needed to exit the container. Then one day I ventured on over to Hobby Lobby to have a look-see. That's when I discovered a beverage dispenser. And, it was acrylic. 1. Acrylic can be drilled. Guts can enter container. 2. Beverage spout can be removed. Guts exit container. Am I like, so totally good at being smart, and stuff? Yeah, so I don't have a great picture of my acrylic beverage dispenser before it was an acrylic display lamp. Sorry 'bout that. But, you get the idea, right? I purchased a lamp kit, also from Hobby Lobby, and used my 40% coupon, making it $6. Oh, I should mention that my drink dispenser was on sale for $11. Making my total lamp price $17. 1. Drill hole through lid. I used the drill bit that was in the section of my bits label "for use with plastic". Eh? Who's back to being smart now? 2. Feed the cord through the spout hole (after you've removed spout, of course). NOTE: once you assemble the lamp pieces, that's it...there's no going back. So, make sure you get that cord in there. Or it's all over. 3. Finish assembling the lamp kit according to the lamp kit instructions. Now, all that's left to do is fill your pretty vase with whatever your heart fancies!! Pinecones and sticks? Nubby yarn in wintry colors? Sure! Okay! What about Valentine pretties? You betcha! You just go ahead and fill that lamp with whatever you want. That's the beauty of being you. Emily I LOVE this!! You are too cute! Great post and great photos. Emily, what a great post and what a great lamp!!! You are so clever! I love the idea of being able to fill it up with different decor items. Too pretty! Great job! you are gonna have fun with this one!! Yes you are very very smart! You are so creative....but I already knew that! You are so stinkin' clever! I love the lamp! I thought it was glass! Using the beverage dispenser - genius - even if your before photo was blurry. Now if you would of forgot to put the cord through, well I maybe wouldn't of been so forgiving and just not used the word genius. I like the pinecones inside. I "used" to have a jar on my mantle, a glass one from Home Goods with pinecones in, so I'm partial. I just found your blog and am your newest follower. This genius us so versatile and simple -- I love it! Thanks for creating such a fab blog full of inspiration. May your creativity and imagination never end! Such a cool idea! My friend Stacey Reinig send me to your site. It's just lovely! Oh my gosh how clever!!! 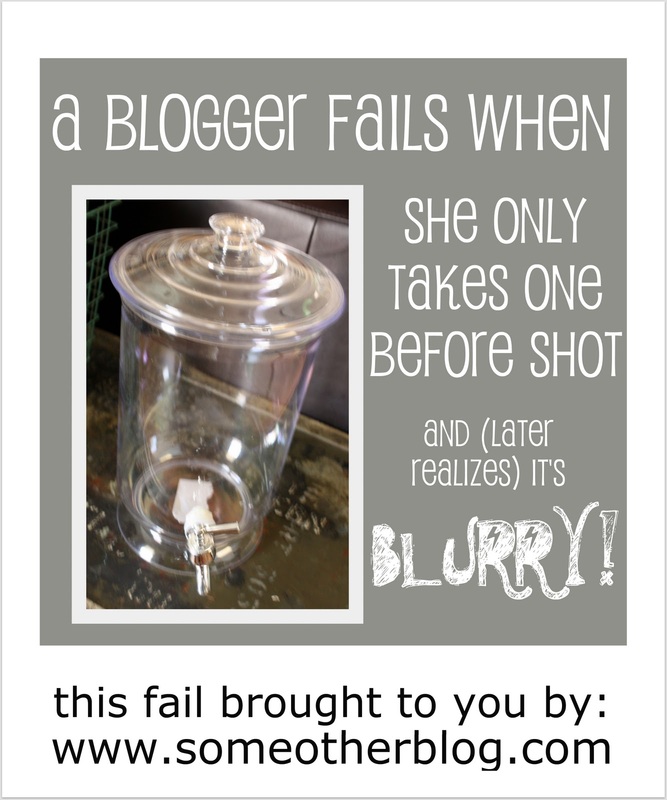 I am seriously scouring my kitchen right now for the drink dispenser I know it is here somewhere!! Thanks for the great inspiration! Great idea! And of course love that globe too (I have a collection)!! So smart you are! Ive looked at this at least 4 times and I still dont think Im crafty enough to make one. Good thing I can come here and get a craft fix :) So cute Em! Love the lamp. So cute for Valentines Day. I can already see it decorated for Easter and Memorial Day. Guess you know what I will be on the lookout for. Love it! Very creative and ingenious! 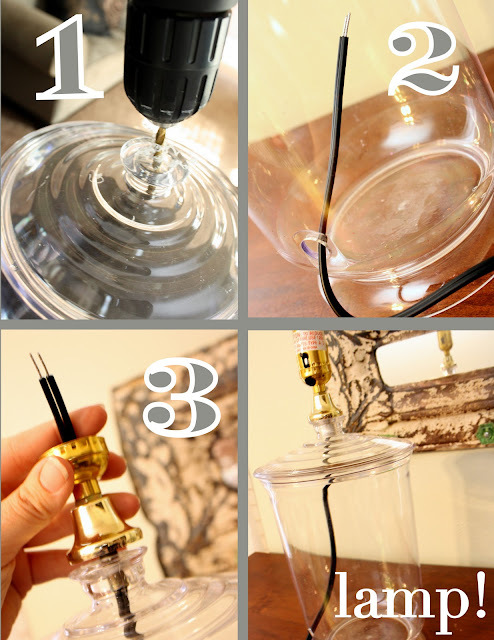 Great lamp and HOW-TO! Thanks so much for sharing at the Tuesday To Do Party! This looks so great! I love how you figured out how to make one vs. just buying it! My brain rarely seems to work that way. What a great idea! I love how it is interchangeable! Great job! Very very cute and totally smart not to spend the $80! It would only have been a fail if the project weren't so awesome! Wow, that is so totally awesome! I love how you can switch it out seasonally! I have a centerpiece like that, but a lamp is even cooler! Can I beg you to share here? That looks utterly fabulous! :D What a great idea! You are a genius - I love it when others find a solution that fits into my budget! Thanks! Consider this pinned! You're brilliant! another amazingly great idea!!!!! I LOVE that you can change it for the decor you are in the mood for!!! Thank you for sharing the how to part!! How clever and resourceful of you!! I LOVE it. Thanks for sharing with us at Link It Up Thursday. You always have such neat stuff I really love that timeline for a birthday. I Stopped by to try to follow all the girls from the mommy panel using the new linky It is such an easy way to read blogs that you like to follow to.